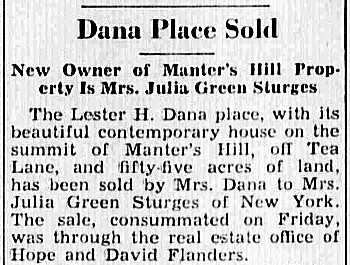 The Lester H. Dana place, with its beautiful contemporary house on the summit of Manter’s Hill, off Tea Lane, and fifty-five acres of land, has been sold by Mrs. Dana to Mrs. Julia Green Sturges of New York. The sale, consummated on Friday, was through the real estate office of Hope and David Flanders. The Dana house, built in 1957, has a 360 degree view of the Island, commanding vistas of Vineyard Sound and also of South Beach and the ocean surf. When the house was new, it was known generally as “the mahogany house” because of the striking use of that wood both inside and outside. Much foresight went into the planning of all the details, and with the landscaped gardens which were added later the property became one of the finest developed places of the Island. Mrs. Sturges, her mother, and Miss Eleanor Pearlson of New York were here on Friday for the signing. The hill on which the house stands was named for Capt. Granville Manter, one of the famous whaling masters of the Vineyard. An older folk name was Ben Burgess’s Hill after a Revolutionary selectman of Tisbury who once lived there.